Former Ireland prop Marcus Horan has announced that he will retire at the end of the season. Horan is Munster's most-capped forward with 224 appearances and he has also won 67 caps for Ireland. The loose-head played a key role in Munster's 2006 and 2008 Heineken Cup successes as well as their Celtic League triumphs in 2003 and 2010. On the Test stage, Horan started for Ireland during their 2009 Grand Slam-clinching championship but aged 35, Horan has now opted to call time on his career. 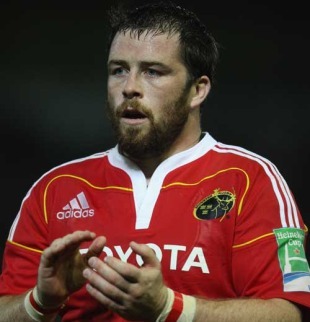 And he has paid tribute to Munster's supporters and his family ahead of his final few games for the province. "Of course it was a tough decision to make," Horan said. "No question of that. You don't walk away from a group like this easily or without sadness. They've been such a huge part of my life. But I'm happy giving the options presented to me, it was the right decision for me and my family. I've had a great career, I've enjoyed every minute of it and I'm proud of what I've achieved. "To that end I'd like to thank all those involved for helping me along the way, be it at club provincial or international level. But I couldn't have achieved what I did without the support of my family and I am grateful to them beyond words. I'm looking forward now to being able to spend a bit more time with them. Hopefully give a little bit back to them now. "Talking about support, I have to mention the marvellous Munster supporters whose unwavering loyalty down the years was another huge factor in making my career so memorable. Fabulous people." Niall Donovan, Horan's forwards coach when he first started out and now Munster's team manager, paid tribute to the loose-head saying: "Throughout that time he conducted himself always with dedication, always in a truly professional manner and in a Munster sense his contribution has been immense. "He's been a great team player, an exemplary squad member, an example to others."